Sprouting sweet potatoes to make slips (the green shoots from a mature sweet potato that are used for planting) is one of our favorite spring activities. 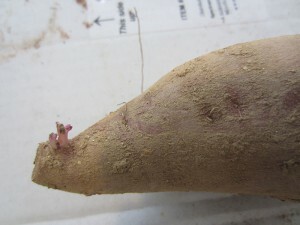 If you haven’t selected and stored roots from last year’s harvest for this purpose, you’ll need to order sweet potato slips (or if you want to add a new variety to your harvest). 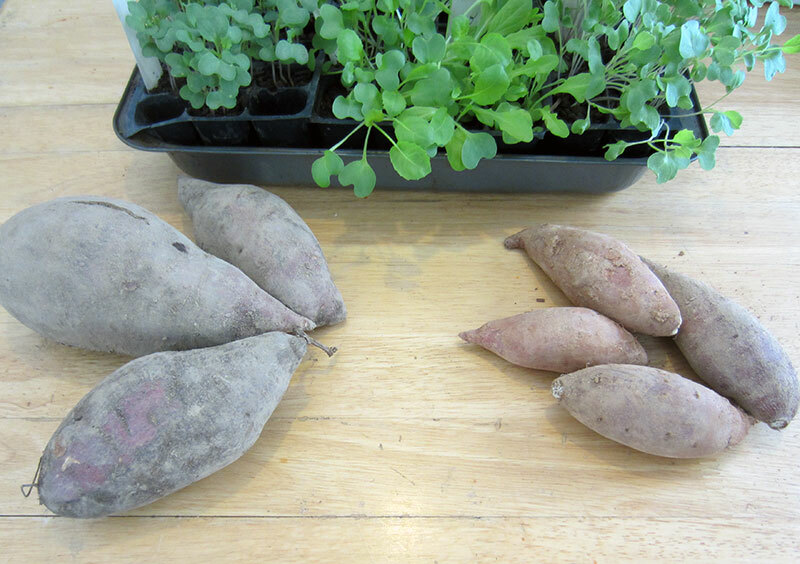 Read on to learn how Sean at Living Energy Farm grows his sweet potato slips in early spring. 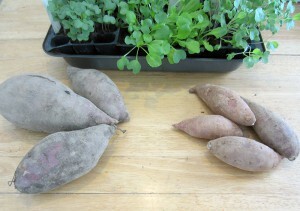 You’ll also learn how to select seed sweet potatoes and store them through the winter to grow your own slips next year. Growing sweet potatoes is a year-round adventure, with lots of activities to keep you busy even in the winter and spring. They’re also an easy vegetable to seed-save and grow again each year. It’s fairly simple, with a bit of knowledge and work, to produce your own sweet potato slips (sweet potato vines) for transplanting. And if you sprout your own roots, you’ll get 2-3 times more slips per sweet potato. That’s a lot of extra taters. The first thing you need to know is which roots to put aside for sprouting. Luckily, the best sweet potatoes for eating aren’t the best for producing slips. All those big impressive sweet potatoes you dug up, you can eat those. It’s the smaller ones you want to save because they’ll be the best for sprouting. 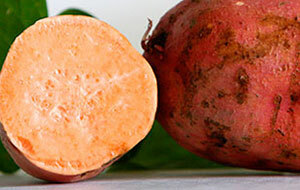 The ideal size for a slip producing sweet potato is about two inches in diameter. 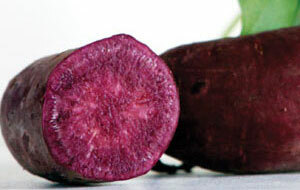 In the photo to the right there are some Violettas, a purple sweet potato with white flesh grown at Living Energy Farm. The large eating ones are on the left, and the smaller ones for slip production on the right. We select our seed stock right in the field after harvest, but you can pick them out now from the roots you’ve been storing. In my kitchen, I find smaller ones left this time of year anyway, because it’s hard not to eat all those big taters first. Winter storage is the same for eating sweet potatoes and slip-producers. It’s best to keep them inside somewhere, in a dark place, like in boxes or paper bags in a closet, and then covered with a blanket to keep out any sunlight. The ideal storing temperature is between 55-60 degrees. If the temperature rises too high they can sprout early, and if it falls below 50 for an extended period of time they’ll harden up and become pretty much useless. It’s great to store your eating sweet potatoes for as long as possible, but storage is even more important if you want to grow sweet potato slips, because those roots will have to make it to March. We store our organic sweet potatoes overwinter with the dirt still on the skins (we gently brush off any excess dirt) because this keeps the skins intact and the roots healthy and ready to sprout in the spring. So you’ve stored your sweet potatoes over the winter and picked out your seed stock. Now it’s time to sprout them. First you want to figure out how many slips you’ll need. Most commercial producers figure on 1000 slips per bushel, but if you’re doing this at home, a good rule of thumb is 10-15 slips for every root around 1-2 inches in diameter (If the roots are eating size figure on about 6 slips per root). It will take about 4 weeks to sprout your sweet potatoes. I put mine in a dark closet the first week of March, the roots in paper bags and boxes for good air ventilation, with a small heater and humidifier on the floor of the closet. The ideal temperature for sprouting is 75-85 degrees with 90% humidity. I keep the door closed to protect them from any sunlight and I check the temperature and refill the humidifier daily. After a couple weeks, you should start to see some sprouts form on the end of the roots. When most of your taters have sprouts about ¼ inch long, they’re ready. If sprouts start getting longer than that before you are ready to plant them, just turn down the heat a bit. If after a couple weeks you don’t see any sprouts, you’ll probably need to turn up the heat. There are sixteen varieties of sweet potatoes in our sprouting closet: orange, white, gold, and purple sweet potatoes, all grown at Living Energy Farm in Virginia. They’ve been sprouting for a few days now. 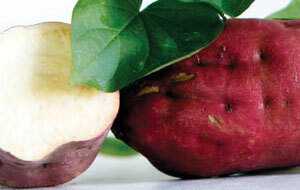 By the end of March the weather will warm up (hopefully) and the sweet potatoes will be all sprouted. Then it’ll be time to bed down the roots, but that’ll be left for another post.